Get the Volume, Fullness, and Plumpness added to your Lips Today! Listen, in today’s society there is an exceedingly high demand for the need of immediate beauty results and that is unquestionable. Time and Beauty are forever evolving and the demands must be met in almost an instant. Waiting in our day in time is no longer an option. Voluptuous, tantalizing lips are desired and sensually attractive. To instantly increase the moisture content and increase volume in the lips we use a cutting edge technology based on the use of hydroscopic material to make a sphere that can penetrate the lips and fill with water. Hyaluronic Acid is the material chosen for its high water-retaining capacity and natural affinity to the body. Hyaluronic Acid is a natural moisturizer with the ability to hold up to 1000 times its molecular weight in water. The hydration process causes a change in volume proportional to the sphere’s moisture-retaining capacity. The immense physical change in volume delivers rapid results, opposed to a biological change that could take months to achieve the same effect. To promote a natural and more sustainable increase in lip volume, PureLeef’s Instant Lip Plumper uses a peptide called Palmitoyl Oligopeptide. This peptide is a specific amino acid that penetrates the epidermal layer of the skin to influence the skin cells. The peptide evokes the skin into initiating a natural repair sequence, which stimulates an increase in collagen and hyaluronic acid. For long term sustained results, we’ve topped off this lip loving formula with Vitamin E (Tocopheral). This natural vitamin is highly beneficial because it aids in reducing transepidermal water loss. This allows the skin to remain soft and healthy for a longer period of time. 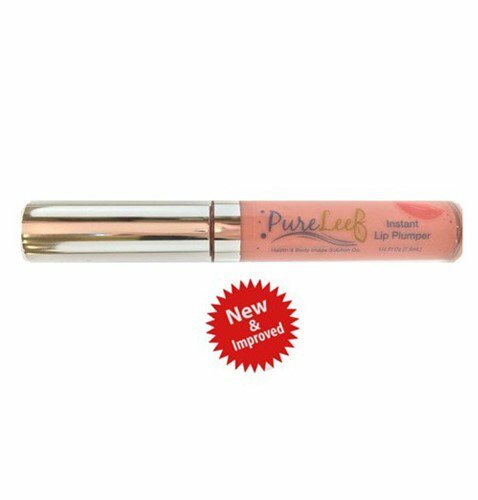 PureLeef’s Instant Lip Plumper contains a remarkable collection of ingredients, instantly plumps the lips, produces increased levels of lip volumizing components and maintains long lasting fullness. On average, application three times a day for 29 days may result in an increase of lip volume by +40%, a reduction of surface folds by – 29% and improved hydration by +60%. Whenever you are ready to pucker up… just apply the Instant Lip Plumper gloss to give you voluminous lips instantly.